Having an energy efficient extension, conservatory or orangery has become increasingly important as the costs of heating and cooling our homes increase every year. Thermal efficiency is an essential consideration for any homeowner who wants to keep their cost of living to a minimum, as a good deal of the heat produced in most extensions, conservatories or orangeries is lost to the surroundings if the house isn't carefully designed to ensure that it maintains a comfortable internal temperature year-round. U-values are closely associated with thermal efficiency and measure how effective a material is an insulator. The lower the U-value is, the better the material is as a heat insulator, and this is extremely important when measuring the thermal efficiency of materials, including windows and doors. Most people try and make their extensions, conservatories or orangeries more thermally efficient, and there are several very good reasons for making this a high priority when you are looking at replacing your roof, or when you are considering adding an extension to your home. For the most environmentally conscious people, the fact that having a more energy efficient home means that their home has a lower carbon footprint and helps to reduce the overall emissions from power plants can be a serious consideration. There is also the fact that a new, thermally efficient roof can be far more attractive than the older roofs, which makes an additional argument for people who are more aesthetically than environmentally inclined. Being able to combine both whilst cutting the household bills helps to ensure that this is an investment that most homeowners really should consider. There is a wide range of options available for people who are looking to increase the thermal efficiency of their extensions, conservatories or orangeries. Ultraframe has a collection of high-performance roofs, including the Classic Roof, the tiled conservatory Ultraroof, and the hybrid Livinroof, all extremely thermally efficient replacement roofs. Thermally efficient roofs are highly recommended by architects and builders when designing new properties due to reduced energy bills for customers. Along with this clear advantage, thermally efficient roofs are usually designed to be more durable than traditional roofs, which will mean that you do not need to replace your roof again for a longer space of time. Ultraframe products are a great place to look when you’re thinking about getting a new extension, conservatory or orangery, regardless of what alterations you happen to be making. If you are looking to have a mixture of solid roof and glass panels to allow for a greater amount of natural light to enter a room, then the options from Ultraframe are likely to be ideal for you. You can get the best of both worlds with the Livinroof hybrid replacement conservatory roof. This style of roof gives you a fully plastered ceiling on the inside with the ability to insert full shaped glazed panels anywhere on the roof. Another option is the Ultraroof which overcomes the twin issues of your conservatory being too hot in summer and too cold in winter. Moreover, it creates a beautiful vaulted plastered ceiling inside - and on the outside a stunning lightweight tiled finish. You can also replace your old polycarbonate roof with a stunning new glass roof, which uses the latest in solar reflective glass technology to make your conservatory more thermally efficient and keep out damaging UV rays. Ultraframe roofs are the ideal choice for your extension, conservatory or orangery for your family home, allowing you to make the most of your space without worrying about your home being too cold in the winter months, and knowing you can get some much-needed respite from the heat during summer. As public interest grows in ensuring that homes are environmentally managed and carbon-efficient, the idea of replacing roofs with thermally efficient options will doubtlessly become ever more popular. Not only to help to reduce all the heating and cooling bills that homeowners increasingly struggle with, but to help to ensure that the world we live in remains as pollution free and environmentally conscious as it is possible to be. The fact that it is easier to recycle modern, thermally efficient roof tiles than the old forms of roofing adds yet another reason to select this form of roof the next time you are in the market - or just want to give your extension, conservatory or orangery a face-lift. When bought from an approved Ultraframe Installer, you can be certain they will be installed to the highest of standards. More and more people today are concerned about their energy bills - that’s why we’ve tried to come up with a simple ranking for each design of conservatory, orangery or extension. 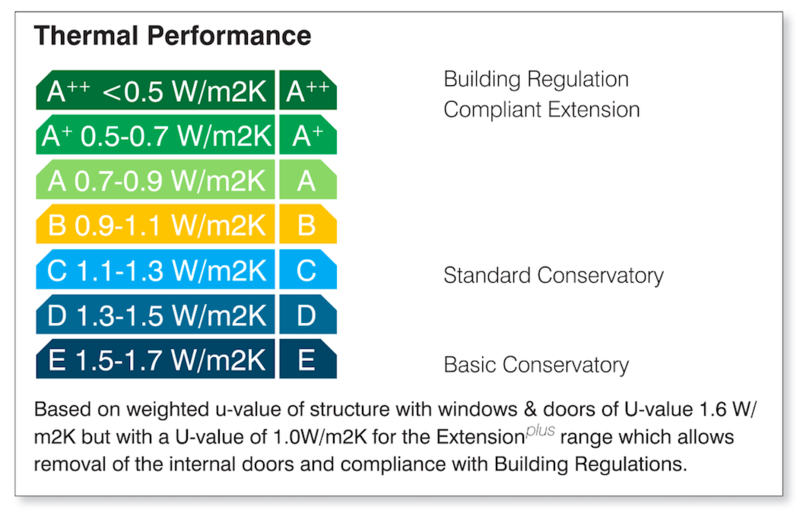 These rankings are based on the thermal performance (heat loss or sometimes called ‘U’ value, the lower the figure the more thermally efficient) of the various elements that are used in the construction of the home addition – items such as the base/foundations and the amount of insulation used, the specification of the walls, windows and doors and of course the roof itself, be it glass or solid. Check out the list of all the building types that make up the Conservatory, Orangery and Extension range - review their individual ratings and see where they fit on the rating scale. Depending on the function you will be using your new room for, in what seasons of the year and for how long each day will help you determine which is the optimum specification for you. Each category is ranked by its thermal performance based upon the complete conservatory U-value with windows and doors remaining constant throughout at 1.6 W/m2K. Typically a 10yr old conservatory would have a U-value of 2.14 W/m2K. For more information, find your local Ultra Installer or contact us today to find out more about you can take the first steps to making your roof modern, environmentally friendly, and working to save you money.